& yes RSS is wonderful – I’m as oversubscribed as the next nerd. But us govt types can’t forget that most people don’t know what RSS feeds are or how to use a feed reader. And they could care less. I find it pretty striking how the RSS bars in this chart are so much shorter than all the others — RSS is the only technology on that list that the majority of people surveyed weren’t familiar with. Makes sense that a more or less representative sample of typical Canucks would be less familiar with RSS than with blogs, social networking, etc. After all, RSS is underlying infrastructure that ties all the other stuff together. Folks using 2.0 technologies are using RSS but they’re not necessarily aware of it. 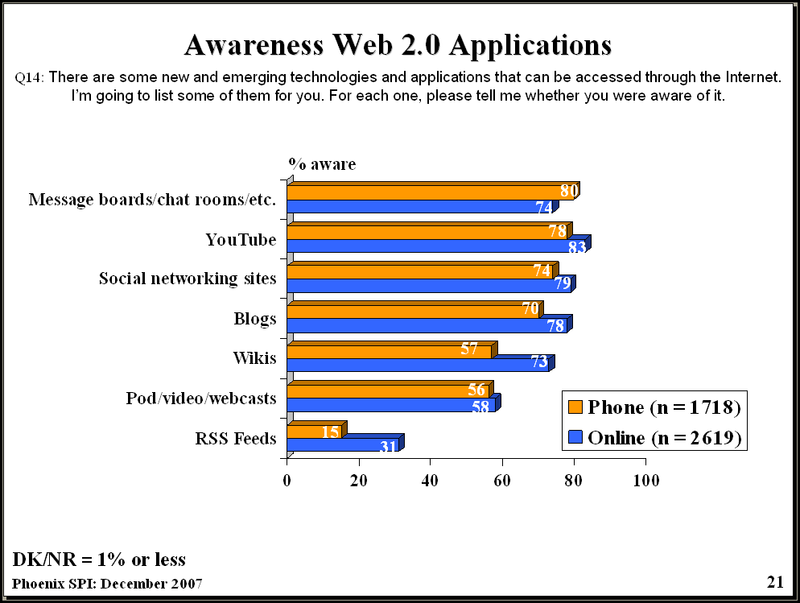 … many Internet users (mainly Web 2.0 users) were familiar with the concept [of RSS feeds] in general, even though they had no specific awareness of RSS feeds. Many, for example, were familiar with the idea of receiving updates from various websites through emails containing links. This included updates from websites of various stores (e.g. Rona), from websites of entertainment-related companies (e.g. Cineplex Odeon), from entertainment-related websites (e.g. Têtes à claques TV), from news sites, and from blogs. Ahem… anyhow, the lesson for me here? If you’re a government site and you want people to subscribe to your updates, it’s great to have RSS feeds. But absolutely make sure you’ve got an email subscription vehicle too – in fact, probably makes sense to put more energy into the email channel than the RSS one.